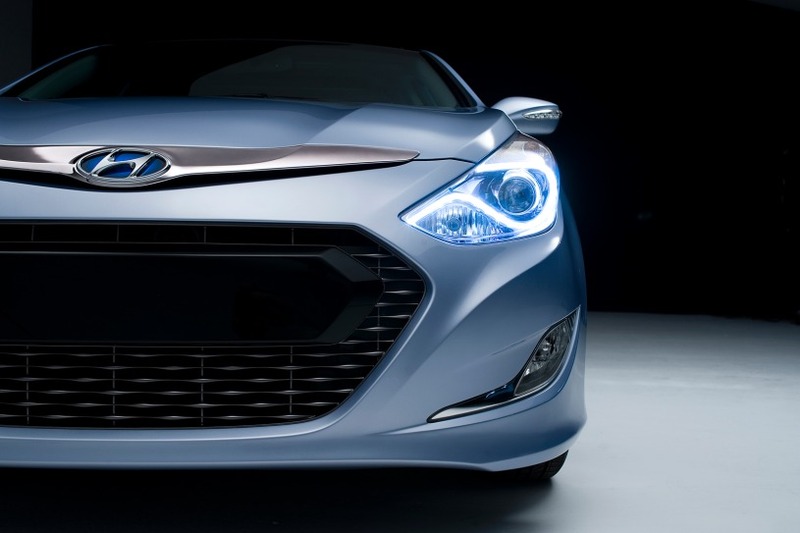 2011 Hyundai Sonata hybrid car to make official public premiere at New York Auto Show! Hyundai Motor America is all set to unveil its first-ever mass produced hybrid car, the 2011 Sonata hybrid sedan, at the forth-coming New York Auto Show, which starts next week. The South Korean largest carmaker today released the very-first teaser image of its brand-new hybrid sedan, giving us a sneak peek preview at the upcoming Sonata hybrid car. It appears that Sonata hybrid will differ a bit from the gasoline-powered version. As you can see from the early teaser image, the 2011 Sonata hybrid car features completely redesigned front-fascia, incorporating fully re-shaped grille, new set of head-lamps and sportier front bumper with larger air intake and slightly updated fog-lights. Reportedly, the 2011 Sonata hybrid car sits on Hyundai’s in-house developed hybrid drive architecture, which was first shown in the prototype form at the L.A. auto show in 2008. The architecture couples highly advanced lithium-polymer batteries with Hyundai’s Blue Drive hybrid system, consisting of 2.4L four-cylinder engine, six-speed automatic transmission and 30kW electric motor. In addition to unveiling the 2011 Sonata hybrid car, Hyundai will also exhibit a turbo-charged Sonata sedan at the Big Apple auto event. The model is expected to house a 2.0L turbo four-cylinder (gasoline) engine with approximately 240 horsepower. According to John Krafcik, the president and CEO of Hyundai Motor America, the 2011 Sonata hybrid will be fully revealed on March 31st, while pricing for Sonata (hybrid and turbo) models will be announced during the official days of the 2010 New York Auto Show.